The dual-brand property broke ground in November 2017 and will feature both a Tru by Hilton and a Home2 Suites by Hilton. Construction is underway on Stonebridge Companies' dual-brand Hilton property in downtown Denver. Stonebridge Companies, headquartered in Denver, is serving as the owner, developer and operator for the new 22-story project that will add 382 hotel rooms and suites to welcome guests to downtown Denver. The property is within walking distance of the Colorado Convention Center. The dual-brand property broke ground in November 2017 and will feature both a Tru by Hilton and a Home2 Suites by Hilton. The dual-brand concept provides larger, more enhanced communal areas and amenities than would be standard for a single brand, benefiting both business and leisure travelers. The project expands Hilton's growing footprint of multi-brand properties in the state. 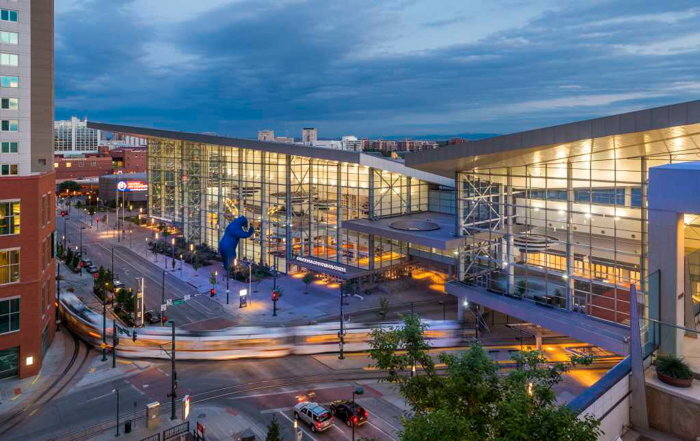 Marking the first Tru by Hilton property within Stonebridge Companies' portfolio, Tru by Hilton Denver Downtown Convention Center will feature 176 guest rooms. Tru by Hilton properties feature the amenities and experiences that matter most to guests, including comfortable beds; smaller, more efficiently designed rooms with a mobile desk; large bathrooms with premium bath amenities; top-rate in-room entertainment; an open lobby with areas for guests to work, play games, eat and lounge; and a 24/7 "Eat. & Sip." market with gourmet snacks and drinks. The hotel experience is enabled by technology including mobile check-in, Digital Key, super-fast free Wi-Fi, remote printing, a social media wall, lobby tablets and accessibility to outlets everywhere. Additionally, Tru by Hilton properties offer fitness centers that leverage the latest fitness trends including barre, TRX bands, free weights, cardio and flexibility gear. Planned to open in late 2019, the 22-story property is located on the corner of 15th and Stout Streets – at 801 15th Street – in the heart of downtown Denver. The property has a mix of unique offerings – each catering to the needs of the brands' respective guests – including designated lobby and dining areas. The property also has a variety of shared amenities including a fitness center, conference room, restaurant and bar, valet parking and a 74,500-square-foot, five-story parking garage with 153 stalls. With occupancy and demand continuing to grow in the downtown area, the infill development will revitalize the area of what was a former parking lot in the city's central business district. The project marks Stonebridge Companies' second dual-brand project in metro Denver, previously delivering the dual Hampton Inn & Suites by Hilton and Homewood Suites by Hilton property located three blocks away. "Developing Stonebridge Companies' second dual-brand project in downtown Denver is a testament to our company's continued success in Denver and beyond," said Navin C. Dimond, founder, president and CEO of Stonebridge Companies. "We are honored to introduce Hilton's respected Tru by Hilton and Home2 Suites by Hilton brands to the downtown Denver market while delivering upon our commitment to provide Distinguished Hospitality™ to our guests."